You probably don't play 5-string banjo, but I do. I have moved some of my banjo stuff from here to the five-string banjo section of my blog. That is where I keep a running account of my playing and events, at least that was the idea. I would very much like to meet and play with other bluegrass fans in and around Tuebingen. If you play guitar, dobro, bass, fiddle, mandolin, banjo, etc., please get in touch with me! Deutsch ist auch kein Problem. Ich wäre ganz besonders daran interessiert, in eine bestehende Band mit Schwerpunkt Bluegrass einzusteigen! My main instrument is a 1995 Deering John Hartford model that I bought in July of 2002 from Wim van der Weg. Drop him a line if you are looking for a good buy on a used instrument here in Europe. The photo on this page shows this banjo. Until May of 2012 I also tinkered around a bit on a fretless Appalachian banjo I got in July of 2009, made completely by hand by Richard K. Smith of Comer, Georgia according to the design published in the Foxfire books. I gab about it a bit here. BLUEGRASS BAND? I'd like to form or join a bluegrass band. Get in touch if interested. HANGMAN'S HILL: The school I teach at is on the "Galgenberg" in Weil der Stadt. We loosely translate that to "Hangman's Hill" as the name of our teacher's folk and bluegrass band. 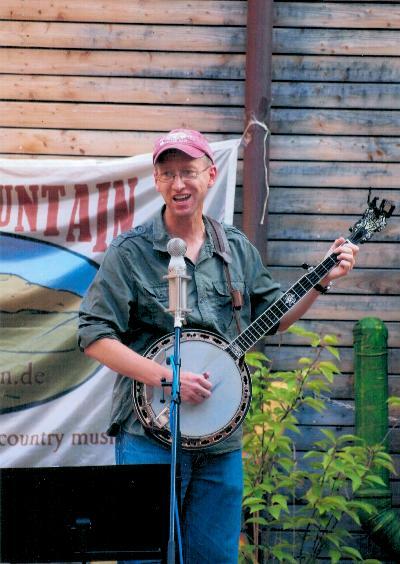 HORSE MOUNTAIN: During the summer of 2011 I played several gigs with Horse Mountain, a bluegrass/roots/country duo/trio based in nearby Kusterdingen. They are pretty much the epicenter of all things bluegrass in and around Tübingen and over a wider radius as well. My stint included a set with them in Bebenhausen at the annual reception of the German-American Institute (30 June 2011) and another set at a matinee performance at the Vorstadttheater (3 July 2011) here in Tübingen. See the whole group here. The photo here shows me with them at the Lorettofest on 10 September 2011 doing Pike County Breakdown, Wabash Cannonball, and Old Home Place. BLUEGRASS SESSION IN PLOCHINGEN: On the first Friday of every month there is an open session for bluegrass in Plochingen. I started going this February of 2011 attended regularly for a while. If you are interested, just contact me and I'll get you on the invitation list. It's for anyone who wants to show up. Sometimes it is postponed a week, however, so I'm not posting the address here. I'm making you get in touch in advance so you don't show up to a non-event. As of the fall of 2016 there is also the possibility of an address change. Music in Derendingen: I am a member of a project that calls itself Haus Orange. We have been meeting somewhat regularly and performing very irregularly for several years under various names. Gigs have included the Derendinger Strassenfest (2010), the opening of the Bürgercafe in Derendingen (2011), an open-air church service for the local congregation (2014) and two performances for the annual open-house of the local children's psychiatric clinic (2013 and 2015). BANJOREE: I attended the first and second Banjoree, a meeting of banjo players in Hagen, Germany back in 2005 and 2007. The event has since continued and moved to another location. EISENBAHN UND LIEBE: On July 22nd, 2005, I performed several songs at a literature reading in Vaihingen/Enz. The writers Johannes Beilharz and Ulrike Dietmann read short stories based on their experiences in America and I played railroad, gospel and other bluegrass and old-time style tunes on my banjo. The reading was sponsored by ligatur e.V. and moderated by Oliver Gassner. The event was announced at www.qshots.de and covered in an article in the 26 July issue of the Vaihinger Kreiszeitung. Several sets of D'Addorio J61, nickel-wound, medium gauge strings (.010, .012, .016, 0.23w, .010). Banjo strings typically sell for over six Euros per set here in Germany. I'll sell these for four Euros each and pay the postage myself. Davis, Janet: Famous Banjo Pickin' Tunes. ISBN: 0786650745. This sells on amazon.de for 7 Euros. I'll sell it for 5 and I pay postage within Germany. A guitar gigbag (eine so-genannte "Tasche"). This is a GEWA-brand bag for concert guitar and is too small for a dreadnaught. It is brand new and cost about 40 Euros in the local store. You can have it for 20 Euros, but you have to pick it up here in Tübingen. SOLD! Leftwich, Brad: Round Peak Style Clawhammer Banjo. SOLD! An Emerson Power bridge. This is a very thin bridge, made to increase volume and improve the the higher tones of the banjo. The one I have here is the old kind and NOT the new "sweet" kind. Make me an offer or trade another bridge for it.